require will load analytics.js asynchronously and execute the callback function once the script has been loaded. That piece of code therefore has the same asynchronicity properties as the original tracking code. The request for analytics.js is simply blocked and an RequireJS receives an error. The result is that require will not invoke the callback and the ga function is never called. If analytics.js is loaded successfully (and unmodified), then that script will replace window.__ga__ by its own function and Google Analytics will work as usual. That implementation takes care of executing the hit callback if one is supplied. This ensures that the trackOutboundLink function works as expected. Note that depending on the Google Analytics features your code uses and the assumptions that it makes about the ga function, you may need to complete that part of the code. 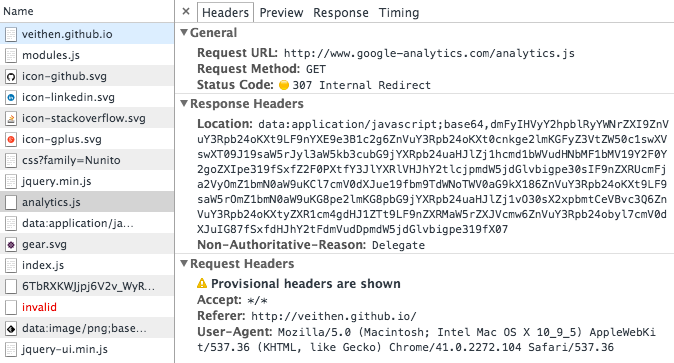 This leaves the scenario where the request for analytics.js is redirected and a different script is loaded. If that script doesn’t replace window.__ga__, then the fallback implementation will be used, exactly as in the previous case. If it replaces window.__ga__, then it will (hopefully) do so with a function that executes any supplied hit callback. The solution is to switch to an alternate method, such as HTML file upload or adding a meta tag to the site’s home page.